As the high priestess of popular fashion reality always reminded us: in fashion, one day you’re in, the net day you’re out. Well, preach on, Heidi, because denim—long presumed to be on the decline—seems to be back in, reappropriating some of the market share it lost to the athleisure movement’s moment in the sun. Across the board, from Wrangler all the way to Gucci, brands are finding that Americans are back into the blues while athleisure’s seemingly unsustainable run (or jog?) proves to be exactly that—unsustainable. In an era where denim-on-denim is making a comeback, some investigation is necessary. So put ‘em on one leg at a time and check your fly, it’s time to fit in some fashion industry market research to understand the flattening of the athleisure market, and denim’s (low) rise, before we speculate on what Americans will be stepping into over the next decade. Twenty years ago, Lululemon popularized if not invented what we today term yoga pants, and thereby the athleisure movement. The active bottoms(!) market is now a $1 billion/year industry and Lululemon is a $15 billion company. As Lululemon surged, people began to worry that denim was dying. They saw the future and in it, we were all dressed like normcore yoga heads who could easily be extras from Demolition Man. Between 2015 and 2016, Denim stock was at record lows in retailers across the country, and jean brands were being spun off from parent companies to control the losses. Simultaneously, between 2011 and 2016, athleisure became 30% of the total clothing and footwear industry, increasing roughly 7% a year—an enormous number compared to apparel’s modest 1% yearly gains. There were several trends at play here. First, the wellness industry has exploded over the past decade and yoga pants have become the uniform of healthier living. And, seriously, who ever thought that our world universe would spawn and support something like Goop? Second, we have been on an informalizing trajectory since the counterculture really took off in the late 1960s. We’ve just been getting less stuffy, less fancy, and less formal—don’t believe me? Check out how people used to dress on airplanes. When your humble blogger flies these days, it’s usually in a track suit, not a three-piece one. 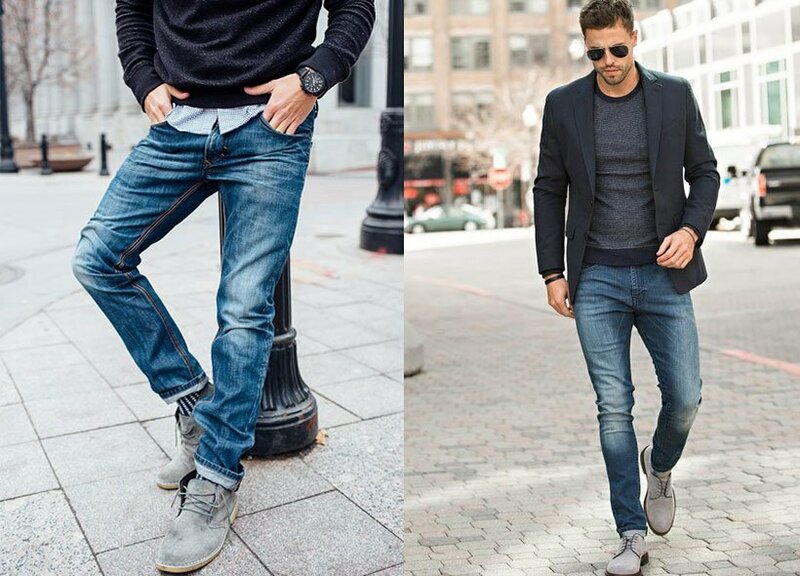 In fact, jeans were a primary beneficiary of this trend, supplanting trousers at work, and khakis and chinos at play. But, overtime, even they became too formal, too constricting, giving birth to an era in which it is entirely acceptable to wear one’s flannel pajama bottoms on the subway. In 2017, for the first time in recorded history, the US imported more stretchy knit pants than it did denim jeans. But the pendulum is swinging back now, as clouds set in on athleisure's horizon while the sun again rises over a blue denim sky. Indeed, like the sweaty man sporting sweatpants on a treadmill, eventually you just run out of steam. Sure the athleisure market is still increasing, growing by roughly 2% over the last two years, but that is nowhere near (a roughly 35% decrease) the jaw-dropping increases in years previous. No, this is not the beginning of the end—we don’t believe our fellow business bloggers are actually asking if “leggings are on their last leg” (they’re overstating it…and the pun is lazy), but they are losing some momentum. Some of athleisure’s problem is that, while it is the highest compliment, imitation also breeds market saturation and fashion fatigue. It’s not just Lululemon, Under Armour, and Nike putting out joggers, leggings, and long stretchy tops. GAP, J-Crew, and Forever 21 all followed suit, to say nothing of upstart brands like Athleta, nearly entirely dedicated to the sporty and sportswear. Hi, Jean, Why so Blue? With athleisure fatigue setting in, denim seems a refreshing alternative. Levis reported an 8% sales increase across the board in 2017. Indeed, over the last year, J-Crew, GAP, Abercrombie, and American Eagle have all reported increased denim sales, for many a bright spot among an otherwise bleak time. Abercrombie, for example, had six years of sliding sales before it hit positive same-store growth, a shift they plainly attributed to increased denim sales. And American Eagle had, according to its president, a “record-setting fall,” the best quarter for denim in the company’s 41-year history. Also, the average price point has risen significantly over the last four years, particularly among men’s jeans where you can expect to pay roughly 28% more than in years past. How expensive? Well, consider these Balmains—good enough for Frank Ocean, good enough for us—currently on sale at Saks Fifth Avenue for $1,295. And that’s chump change compared to Gucci’s hyper premium line, currently going for $3,134. In fact, jeans are so cool these days, they are once again flashpoint for invention and creativity, for better and for worse. For the “worse” column, look no further than these $375, asymmetrical jeans by Ksenia Schnaider with one flared bell-bottom leg and one skinny, ankle hugging leg. Yikes. What is driving millennials back into their button-fly 501s? As with most things millennials like, there is a significant nostalgia component involved. First, the culture is currently in the midst of an early-90s revival as upwardly mobile millennials long for the familiar times and wares of their youth (side note, be thankful for small favors: this 90s revival has focused on the lighter blues and distressed styles of the decade, not its sagging jeans and khaki cargo pants nadir. We won’t go back, we can’t go back). One big beneficiary of this selective look back, Calvin Klein whose heroin chic looks from the early 90s scandalized, titillated, and ultimately drove the fashions of an entire generation. Gosh, remember those simpler times when the first lady railed against fashion and rap music, Marky Mark was on billboards not movie screens, and the biggest political scandal involved a blue dress? A lot of this nostalgia wave is cresting at local and online secondhand stores, where hipsters and bargain hunters alike are searching for vintage denim that will add a flare (as in pizazz—flared legs remain a questionable choice) to their look that simply cannot be accomplished by yoga pants and jogger sweats. These days, wearing “outside” clothes has become optional—it is perfectly acceptable to roll through the mall, airport, and doctor’s office in yoga pants, sweatpants, joggers, or even pajamas. But, having stripped jeans of their mandate, millennials are nonetheless favoring them, not because they are a bare minimum requirement to enter the civic world, but because they choose to. Consumers pushed fashion to its normcore edge, stared into the sweat pant abyss, and are now dusting off the denim once again. How else to explain Levi’s new $300/pair Authorized Vintage line, a limited collection of 50,000 flashback pants riding the nostalgia-inspired vintage wave sweeping fashion. “We were sitting on an aged icon,” Levi’s president recently told the Wall Street Journal. Imitation/flattery goes both ways. Just as Lululemon saw its best ideas aped by denim producers, they too are now borrowing from current trends. Indeed, as denim becomes cool again, Lululemon is expanding into more traditional outerwear, recently launching a $128, 5-pocket men’s jeans. Yes, they are stretchy and comfy, but advertisements depict them with leather dress shoes. They are like the denim mullet—business on the outside, party on the inside—and this seems to be the future of jeans and athleisure, something like jeggings, pants that look like denim but stretch and fit like sweats. Elastane and lycra are now common jean components—American Eagle even sorts its jeans by their level of stretch—as designers find a happy balance between denim streetwear and stretchy gymwear. And finding that balance, of course, requires fashion retail industry market research. It will tell you if your clothes are comfy and stylish, or if they are just a stretch.